Since some of our most popular (and best-selling) authors are bakers, we thought we’d focus on their creative journeys and see how their book-making (and treat-making) processes can inspire everyone to make something truly amazing. We contacted some of our favorite baker/authors and asked them a series of questions in a veritable virtual roundtable conversation to see how different authors approach book-making. Here’s hoping at least one of them speaks to you and your particular creative process. So how long have you been baking? Katie Drummond: I’ve always loved baking, but I started doing it more often after we got a stand mixer as a wedding gift a couple of years ago. We keep the mixer on the counter top and it’s always begging to be used! Ashley Kollenz: I have never been much of a baker until I had volunteered to bake a cake for my girlfriend’s baby shower last year. The cake turned out so well and I had so much fun doing it that I started baking more and more. Now baking, cupcakes especially, has really become my passion. I made sure when I was putting together my recipes that the ingredients were simple and the directions were straightforward. We are all busy people nowadays; baking should be fun and stress-free. I kept that in mind when creating these recipes. Harriet Nichols Monroe: I have been baking for most of my life. As I explain in the introduction to “Grandma’s Home Bakery,” my Grandmother welcomed me into her kitchen when I was very young and allowed me first to watch and then to help her cook. What inspired you to turn your recipes into a print book? Katie: These are my grandma’s recipes. She’s fed the hearts and bellies of three generations of my family with these delicious desserts. We all have our favorites and there are so many memories associated with these treats. My grandma is 91 years old and I thought making a cookbook and telling her story through these desserts would be a meaningful way to pass on the recipes to her grandkids, great-grandkids, and beyond. It was a way of transcribing her handwritten recipe cards, which eventually fade, into a more permanent collection. Ashley: I had all of my recipes written down in a notebook and I kept thinking how great it would be to have my recipes in a cookbook! I thought my recipes were great and thought that others may enjoy using my recipes also. Harriet: I have wanted to publish a cookbook of one sort or another for a number of years. I had originally envisioned it as a large collection of family recipes, my experience as a professional chef, and a record of the personal chef service for seniors that I created and operated for a number of years. That sort of “magnum opus” almost never is completed. Last year, I was looking for an appropriate and personal wedding gift for a number of the younger members of the family. My two younger cousins and a nephew were getting married in the same year. None of them had had the same opportunity to know their grandmother or great-grandmother. 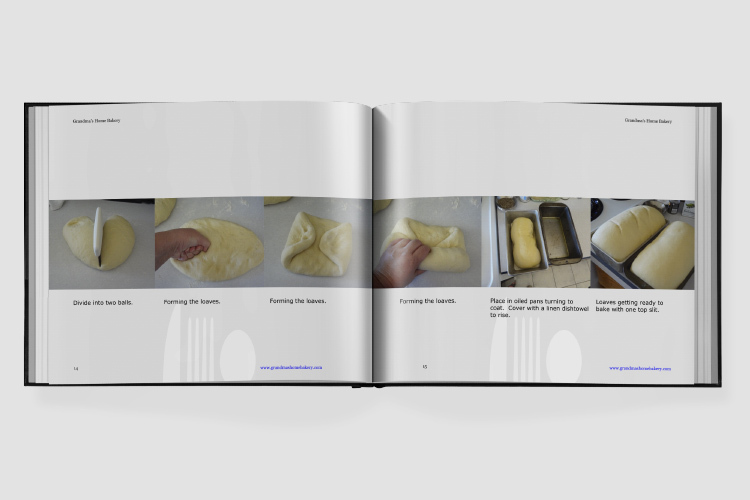 The idea formed of a cookbook that would be a tribute to our grandmother, preserve the family recipes that had been handed down for generations, and to take the opportunity to teach basic techniques of baking as I had been taught. What were you looking for in a publishing platform? Katie: I wanted a platform that would allow me to create aprofessional-quality book. It also had to be easy to use. I was really impressed with the quality of the books that I saw in Blurb’s online bookstore. Once I downloaded the software, I realized that it would give me the flexibility and tools that I needed to make the book I had imagined creating. I also love that the software was free and that I created the entire book on my laptop. Ashley: I was looking for something simple and user friendly. I found Blurb to be simple and hassle free. I like the fact that I own the rights to my recipes and photographs. 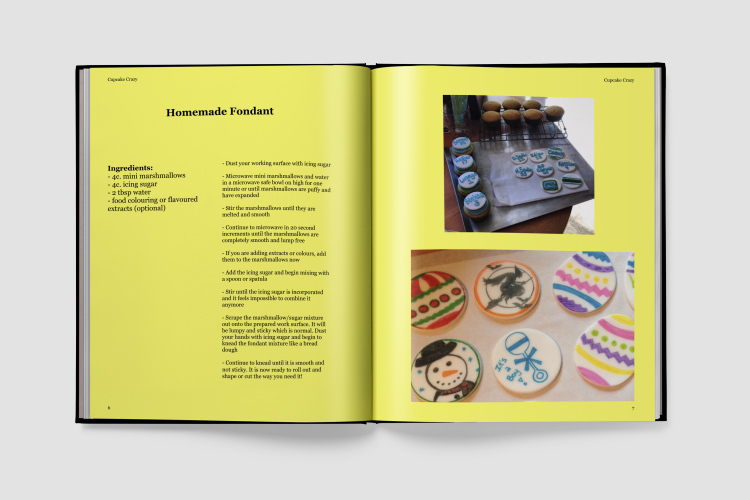 Harriet: The cookbook as I envisioned it would be a relatively small collection of recipes but rich in photography. I wanted the instruction through photos and descriptive text to be at least as important as the recipes. I wanted it to be both beautiful and completely functional as a teaching tool. I began by retesting each recipe and photographing each step in the process. As I continued this process I realized that while I had used these recipes all my life, I had modified and adapted them to my needs building upon the changes made in her turn by my grandmother. I added the information about the process of adapting and changing recipes so that the reader could be empowered to continue to modify and imagine new uses and flavors. I had been aware of Blurb.com for a number of years. I had used the service to create a photo album of a cruise to Alaska I had taken with my sister and father. The quality of the printing of my photographs exceeded my expectations and, although expensive as a print-to order book, my plan for the cookbook as a wedding gift would be well served by the quality of the printing I knew I would be able to achieve. How did you handle the food photography? Katie: I’m not an experienced photographer, but I got some food styling pointers from a friend who is a professional. I kept things really simple. There were a few desserts that needed multiple shoots and some that didn’t make it into the book at all! Ashley: To be honest, I look a lot of the photos myself with a smartphone and filter. Any of the more professional photographs were taken by my good friend, Clair Linden Parke. Harriet: Prior to my training as a professional chef I had studied photography as an undergraduate student at Goucher College. I graduated with a degree in Fine Art and expected photography to be a part of my life/career. Although I went in a few different directions that did not use my photographic skills directly, I was able to call on my experience to take and select photographs that would help to illustrate important points in the instructional narrative and to make the food enticing. Katie: I love the recipe for lemon meringue pie. My father passed away when I was 15 and it was his favorite dessert. I didn’t like the pie when I was little (fruity desserts were seriously sub-par to chocolate ones) but I’ve grown to love it. I made it for the first time last summer, and I think it will become a go-to dessert because it reminds me of my dad. Ashley: This is a very tough question, as I love all the recipes in my book! They are all my own… it’s like asking me to choose who my favourite family member is! I really love the Strawberry Shortcake Cupcakes, the Maple Bacon Cupcakes, and the Chocolate Salted Caramel cupcakes. I really enjoy making the Neapolitan cupcakes as they are so fun and beautiful. Harriet: I have many favorites in this book. For sheer versatility and reliability I would say the Sugar Cookie recipe is my favorite. It has formed the basis for many successful variations. The White Bread recipe is a favorite because it unlocks the secrets of yeast dough and also offers the opportunity for adaption. The final recipe in the book, Pecan Sticky Buns, is a variation on the first recipe in the book, White Bread. My favorite for pure enjoyment is the recipe for Nut Cakes. It is absolutely delicious and the first recipe my Grandmother taught me to make completely on my own. Are you inspired by any celebrity (or non-celebrity) bakers or chefs? Katie: There are a few food bloggers that I became obsessed with over the past year while working on this project. I also used Pinterest to make a board of food styling inspiration. If I knew I would be shooting icing soon, I would search Pinterest for shots of icing and pin the ones that I liked to my board. When it came time for the shoot, I used it as a reference to set up my shot. That was probably my biggest source of inspiration. Ashley: My sister really is my biggest inspiration. She is an incredible young woman and she used to be the big baker in the family. I come from a very close family. My mom and dad have really made a point of being there for my sister and I. They are incredible parents. My mom is the baker and my dad is a phenomenal cook. I guess “culinary” skills run in the family. Harriet: Not really. I get inspiration from many people and I am continuously searching for more perfect combinations of flavors. 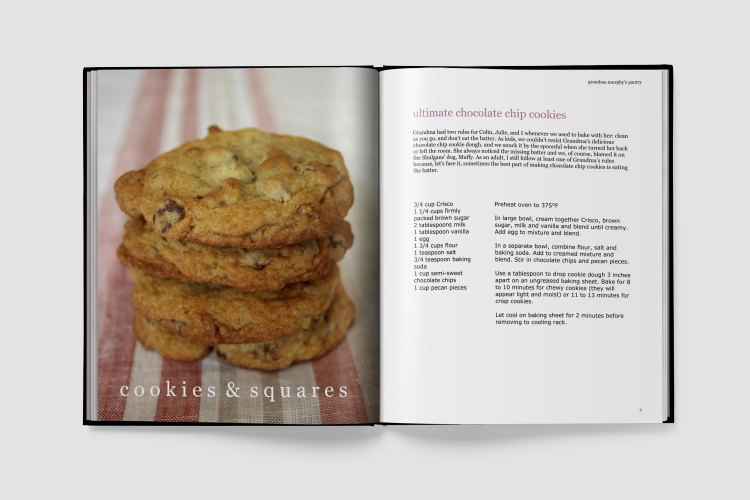 Katie: Once the book was finished I started sharing the recipes on my blog (https://lovewritenow.com/). I absolutely loved making this cookbook. There were epic recipe fails and photo shoot fails along the way, but I loved hearing my grandma’s stories about food, life and love and sharing them with our family. I work as an online lifestyle editor and social media manager, and telling and sharing stories is my passion⎯especially stories that are this dear to my heart. There are a lot of wonderful cooks in my family and I have fantasies of making another book with savory recipes, but for now, I’m enjoying sharing these sweet stories with friends and family through this book and my blog. Ashley: I have sold a few copies of my book at a Christmas fair. I also hosted a release party for my friends and family. I would love to see my book on the shelves of some major bookstores like Chapters Indigo and Barnes & Noble. Those are big dreams, but with big dreams come big successes! Harriet: I created the book for a single purpose (a wedding gift), which it has fulfilled wonderfully. Once it was complete I saw in it an opportunity to share these recipes and techniques more widely. I decided to see if I could help the little cookbook to find a whole new audience. Blurb.com converted the print version to an eBook format compatible with IPad and to PDF format. I was able to find a conversion service that would take the PDF format and make it compatible with Kindle. I have been working with a very limited budget to spread the word on the internet about the little cookbook (on a Facebook page and on my website) and direct potential buyers to Blurb.com, Amazon.com and Apple’s ITunes Store. I am delighted that Blurb.com has taken an interest in my book and has provided this new opportunity to get the word out. The original printed version is my favorite. It fulfills all my hopes for beauty and utility but the text and photographs are also wonderful as an eBook and this format may bring the book to a wider audience on a budget. Finally, this little cookbook has been a tremendous learning experience for me. I have new appreciation for the contributions of editors and the work of publishers who smooth the way for new books entering the marketplace. I hope that by drawing attention to this little book I may find a publisher willing to work with me on the next book I have in mind. That book will bring all my recipes, experience, and skill working with the elderly to families dealing with the need to provide flavorful nutrition to their senior members.